This is an exceptional 1701 map by Herman Moll depicting the United States and part of Canada. Molls relatively small map covers from Fort Frontenac and the Ontario River east to the Pacific Ocean. Mexico City appears in the border. This map is remarkable on a number of levels including the depiction of California as an Island and it's rendering of the Great Lakes and the Mississippi Valley. We begin our examination of the map in the west. Moll boldly presents California in insular form on the Luke Foxe model popularized by Nicholas Sanson in 1657. Luke Foxe as an English navigator who lead a 1631 expedition in search of the Northwest Passage. Although he had no luck in his hunt, his expedition lost no lives, which is a feat for early explores in Arctic waters. The maps associated with his expedition featured a surprising illustration of California in island form. It was Foxe who is credited with introducing the curious form of northern Insular California, including the Bay of Talago, and the unusual peninsula extending from the mainland, Agubela de Gato (both noted in this map), and the Rio de Estiete. The origin of this cartography beyond Foxe remains a mystery given that Foxe himself never sailed anywhere near California. Baja California was subsequently discovered in 1533 by Fortun Ximenez, who had been sent to the area by Hernan Cortez. When Cortez himself traveled to Baja, he must have had Montalvo's novel in mind, for he immediately claimed the 'Island of California' for the Spanish King. By the late 16th and early 17th century ample evidence had been amassed, through explorations of the region by Francisco de Ulloa, Hernando de Alarcon and others, that California was in fact a peninsula. However, by this time other factors were in play. Francis Drake had sailed north and claimed 'New Albion' (identified here on the northwest coast of California Island) near modern day Washington or Vancouver for England. 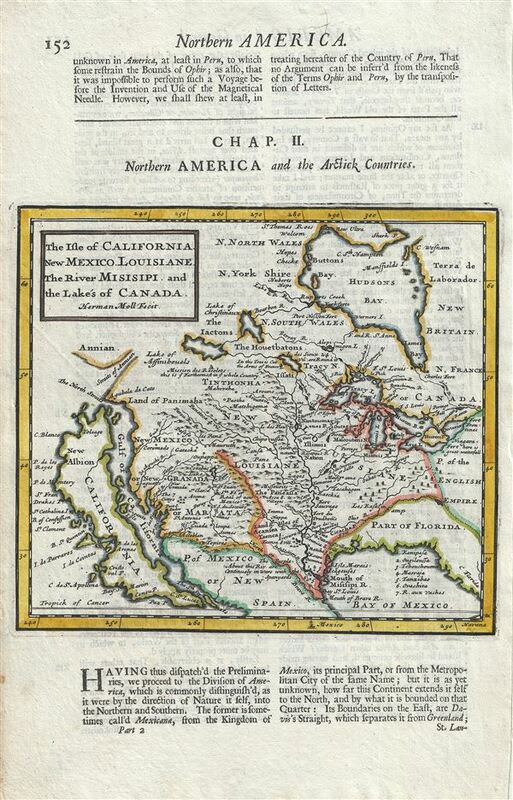 The Spanish thus needed to promote Cortez's claim on the 'Island of California' to preempt English claims on the western coast of North America. The significant influence of the Spanish crown on European cartographers caused a major resurgence of the Insular California theory. Eventually Eusebio Kino, a Jesuit missionary, traveled overland from Mexico to California, proving conclusively the peninsularity of California. Just north of California, the map notes the Strait of Anian and further the coast of Anian (Annian). The idea of Anian was derived from Rasmusio's 1559 edition of Marco Polo's travels which describes 'Ania' or 'Anan' as a Chinese province accessed via a watery straight. Some speculate that this may have referred to the New World, though Polo himself places it somewhere near India. Anian's, first cartographic appearance was only a few years later in a 1562 map by Giacomo Gastaldi. Gastaldi seems to be the man responsible for Anian's presence in the New World. The idea was embraced by other cartographers and intellectuals of the period. John Donne sums the idea up in a poem, 'Anyan if I go west by the North-West passage.' In the 18th century, it was interpreted as the Bering Strait by cartographers, successfully transitioning it from the realms of fiction to cartography. Anian presupposed the existence of a Northwest Passage and, as such, was entirely mythical, though the lands that are now Alaska long bore that name. Eastward, the Conibas Lake is shown to be the source of the North or Brave River (Rio Grande), which is shown to correctly empty into the Gulf of Mexico (Bay of Mexico). A note along the river reads 'The People about this river are continualy in war with the Spanyardds.' Missourits, on the bank of what would become the Missouri River is noted. A note west of the source of the Mississippi reads 'In this tree is cut the Arms of France.' Further west and just south of the Lake of Assinibouels, the Mission des Recolets (referring to the Jesuit missions in North America) is located with a note below reading 'This is the farthermost in the whole Country.' The map also notes several Indian villages, French and English forts and settlements, including the Niagara Fort, and various cities and place names throughout. The speculative details represented on this map also highlight how little was known about the region at the time. Lake Superior is names Lake Tracy, while Lake Michigan is Illinois Lake. Just west of Lake Michigan, where Green Bay is today, the Bay of Puants is noted. Apparantly, after the French first discovered Lake Michigan in the 1600s, it was called 'Lake of the Puants' for a time after the people who occupied its shores (the Winnebago Indians were called 'Puants' by the French). Green Bay was named the 'Baye de Puans.' Later, in about 1679, the lake was known as 'Lac des Illinois' as it gave access to the country of the Indians, so named. Overall, this is an important map noting the cartographic speculations of the time, with numerous amount of details for a small format map. This map is one of the most remarkable maps featured in Herman Moll's 1701 System of Geography. OCLC: 225273620. Boston Public Library, Leventhal Map Center, G3300 1701 .M6.